Watch your tuning on extreme bends and you'll have a semi-acoustic workhorse with a truly individual sound. Comfortable neck. Great for rootsy blues and rock 'n' roll. Slight intonation issues on big bends. Used by the likes of Buddy Guy, the Starfire was one of Guild's most popular models in the 60s. Now the Newark St edition offers a vintage-styled specification to match its heyday. At first blush, its aesthetic puts it in competition with Gibson's ES-335. But make no mistake: the Starfire has a voice all of its own. "The Starfire articulates that middle ground between rootsy blues and roughhouse rock 'n' roll jangle,"
Looking past the double-cut, semi-hollow body, it has a quite different construction, too: the Starfire has a pressed laminate mahogany build, with a three-piece mahogany-maple-mahogany sandwich neck, and a maple centre-block for ballast. Acoustically, the Starfire IV is bright and bold, and the pair of Guild Anti-Hum Dual-Coil pickups that grace the neck and bridge positions are a natural fit. Consider them reluctant humbuckers: a low-output option that's happier teasing every bit of brightness out of the Starfire IV. In the bridge position, it has a gentle snap and snarl, coruscating but never shrill, and while the neck pickup rounds off some of that sharpness, it never gets lost in the clay. The Starfire articulates that middle ground between rootsy blues and roughhouse rock 'n' roll jangle, rewards note-heavy jazz and blissed-out fingerpicking and, thanks to that unpinned rosewood bridge piece, it is a little punishing when really choking the bejeezus out of your bends, knocking the tuning a little off-base. 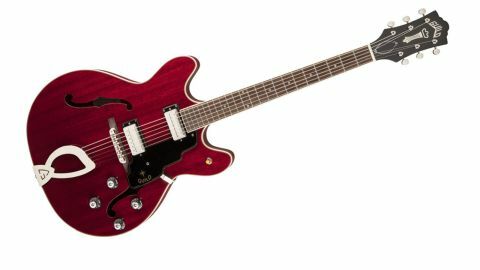 But, when you consider the Starfire's soft U-profile neck, jumbo frets and ultra-comfortable ride, that's a minor foible.